Grape phylloxera is regarded as the worst pest of grapevines, as there is no effective way of controlling it in ungrafted vines. Infested vines decline in vigour and can eventually die. Phylloxera is an aphid-like insect that lives on the roots of grapevines. It’s found in parts of New South Wales and Victoria and is subject to movement controls. If you think you have seen signs of plants suffering from grapevine phylloxera outside of known areas in NSW and Victoria, or anywhere else in Australia, call 1800 084 881. 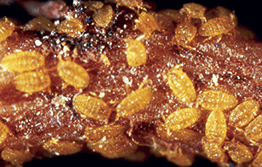 The pest is spread by the movement of infested grapevine, rootlings, equipment and soil from infested areas.